I love dice, so when MathArtFun‘s 120-sided Disdyakis Triacontahedron crossed my stream, I ordered one — along with a couple other oddities. The big red one’s the d120, of course. 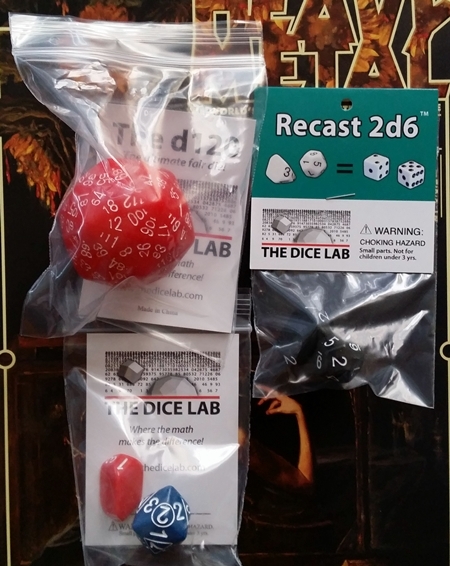 To the right of it is their “Recast 2d6” pack (a version of Sicherman dice that uses a d12 and a d3), and below those are a d3 and a MultiDie. Weighing almost 3 ounces, the d120 is a hand-filling monster — about the size of a large lime or a small lemon. Like the Zocchihedron, stopping isn’t the d120’s forte — but for basically being a big ball, it actually stops fairly quickly. Like the accompanying card says, it’s numerically balanced in the same way as most dice: all pairs of opposite faces add up to N+1, where N is the number of sides. It’s a nifty little beast. The MultiDie is a d3 (unembellished numbers, on the faces), a d4 (numbers inside triangles, on vertices), and a d2 (circled numbers, also on vertices). After rolling, you read the top face or the number to either side of it; it works surprisingly well. This one is quite clever: It’s a d3, in an interesting lozenge shape unlike all of my other d3s (but most like the even-more-lozenge-y Gamescience version), and a d12 numbered 1, 2, 3, 4, 4, 5, 5, 6, 6, 7, 8, 9. Roll the pair of them, and you get the same spread of probabilities as an ordinary 2d6 roll. With all the PbtA games I’ve been playing lately, I figured these could be fun to add to my dice roster. The paint job on most of the dice I received is below Chessex quality (my go-to for non-precision edge dice), but apart from that they’re nicely made. 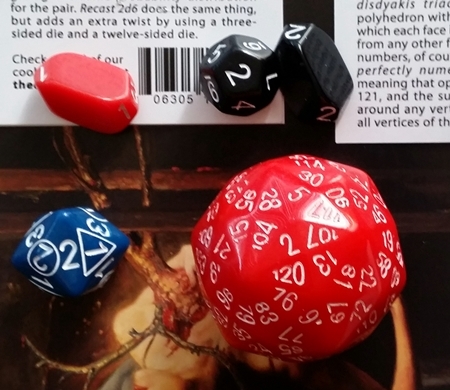 I dig the funkiness of the d120, and the Recast 2d6 set appeals to my inner probability geek. All in all, I’m glad I picked these up. I ordered a second d3 because I like my d3s to be a different shape than my d6s (it makes them easier to spot in the pile) . . . but I somehow missed that I’d be getting the same style of d3 in the Recast 2d6 set. Heh. I remember a young gamer finding a pair of average dice in my bag and being totally confused by the concept. 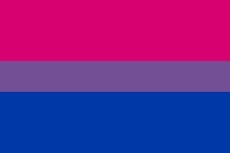 I had to explain that they weren’t intended to be rolled in multiples (usually) but as singletons. I’m not sure I carried the concept across very well. Also demonstrated how a d10 and a d6 could do duty as a quick D20 and a D30 during a game of Realms of Cthulhu when helicopter wreckage (Marine One!) rained down on the would-be President rescuers as they fought off the Deep One crush on a 20×30 hex-gridded rooftop. The idea of using a d10 and a d2/d3 to “index” it blew a couple of minds. Old gamers. We does Arithmetic in our heads on the fly, so we does my precious.